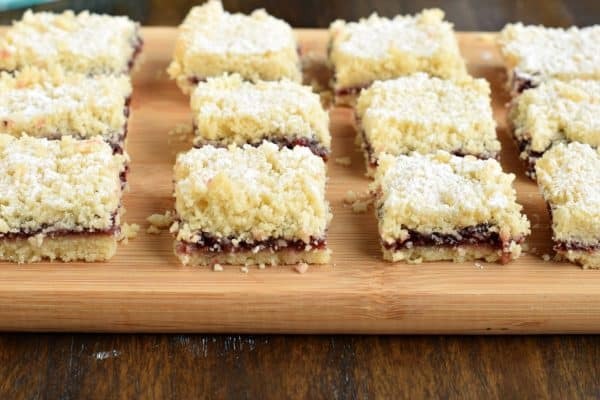 These Raspberry Shortbread Bars have been front and center in my life since before Christmas. 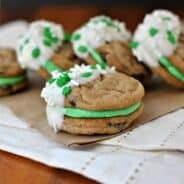 My good friend and workout partner, Kelly (Hi girl), brought these to a cookie exchange party at my house, and I immediately begged for the recipe. I’ve since made them half a dozen times before finally hiding them so that I could get some photos taken. 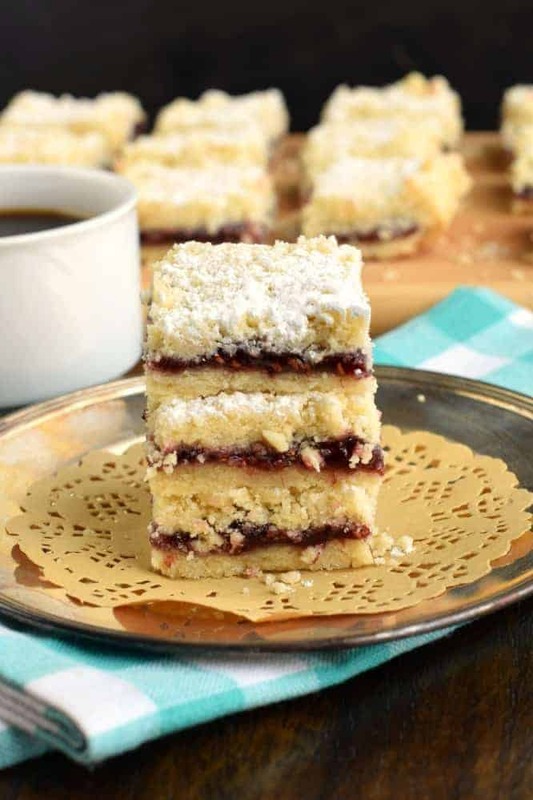 If you’re looking for your next, tried and true, dessert recipe, you need to try baking up a batch of these Raspberry Bars! I’ll give you all my secrets in how to make these amazing, and even what I did wrong the first time I baked them! First things first, you’ll need to start with softened butter. Typically 30 minutes at room temperature does the trick, unless your house is freezing like mine, go for an hour! To speed things up, you could put hot water in a large tumbler, then dump it out, and put the tumbler over the sticks of butter. This works really well! Once your butter is softened it’s time to make the shortbread cookie crust and crumble. Yes, with this recipe there’s no separate “crumble” or streusel topping. You just divide the dough in half. Preheat your oven to 350 degrees F. Line a 13×9 baking dish with parchment paper. Set aside. In a large mixing bowl, combine softened butter with vanilla and granulated sugar. Beat until creamy and combined. Add in flour and mix until the flour has incorporated into the butter mixture. It will resemble CRUMBS at this point. To check if you’ve mixed it enough, grab a pinchful of the dough and press it in your fingers. If it stick together, you’re good. If it’s still flour-y and crumbly, keep mixing. Pour half of the crumbs (cookie dough) into the baking dish. Using the bottom of your measuring cup (or the palm of your hand) press the dough firmly into the dish. Just when you think you’re done, press it all again. This is what creates your cookie crust! Next, spread the raspberry preserves even over this layer. The best way to do this is to drop the jam by tablespoonful onto various parts of the dough. Then use an offset spatula to gently spread the raspberry preserves all over the top of the cookie dough. Finally, sprinkle your remaining crumb mixture over the top of the preserves until done. Bake in a preheated oven for 31-33 minutes, until lightly browned. Remove and cool completely. Top generously with powdered sugar when cool. Cut and enjoy! 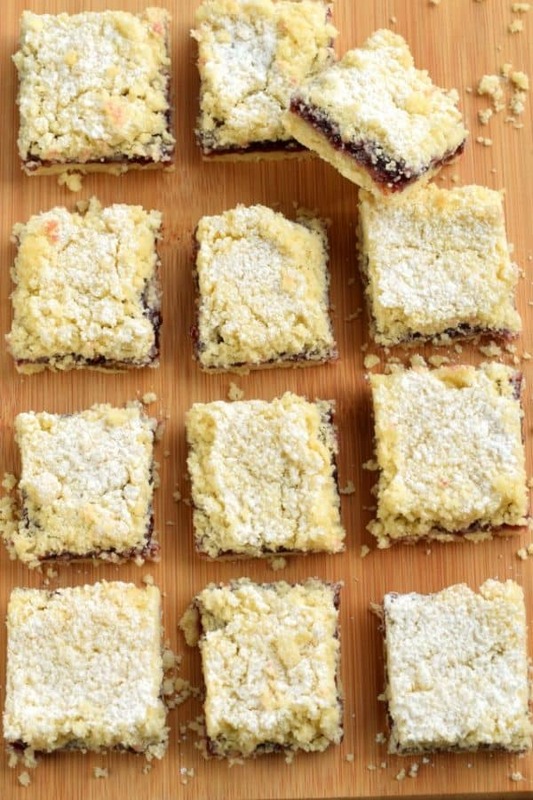 First, when adding your second layer of crumbs to the cookie bars, do NOT press these crumbs into the bar. ONLY press the first layer of cookie dough. I accidentally pressed the second layer when I made these bars for the first time. While it tasted just fine, they looked super weird. No crumble on top. Also speaking of crumbs and crumbles…you’re going to think it’s missing liquid. If you’ve ever made shortbread bars you know it’s not a typical cookie dough. It’s more like a bowl of crumbs. But be sure to test that you have combined your butter into your flour by pressing a fingerful of dough together. It should press together and stick, that’s how you know it’s ready! Also, when choosing raspberry preserves, try to find the chunkiest brand possible. I loved having those thick chunks in my cookie bars! Finally, if you want beautiful cut cookie bars, your best results will happen if you refrigerate the bars FIRST. Once they have cooled, cover the bars with plastic wrap and refrigerate. Once chilled, they cut so much easier. You can then top them with powdered sugar! 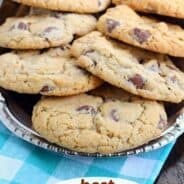 Delicious, buttery Chocolate Chip Toffee Shortbread Cookies recipe. Perfect to bake and share, or freeze for later! Jingles Cookies: sweet shortbread cookies with anise extract. Preheat oven to 350 degrees F. Line a 13x9 baking dish with parchment paper. Set aside. In a large mixing bowl, combine butter, granulated sugar, and vanilla extract. Blend together until fully combined. Add in flour and mix until butter is incorporated. Mixture will be crumbly. You should be able to pinch the cookie dough and it sticks together. Pour half the crumbs into the bottom of your baking dish. Press firmly with the palm or your hand or bottom of a measuring cup until firmly pressed into the dish. Spread raspberry preserves, gently, over the bottom layer of cookie. 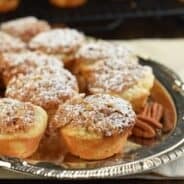 Sprinkle remaining crumbs on top of raspberry preserves. Do not press! Bake for 31-33 minutes until lightly browned. Remove from oven and cool completely. For best results in cutting, refrigerate after cooling for up to an hour. Cut into slices and sprinkle generously with powdered sugar. Store in air tight container in refrigerator or at room temperature. 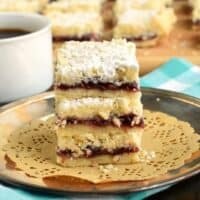 I’m absolutely hooked on these melt-in-your-mouth shortbread bars! Going to be trying them with strawberry preserves next! Thank you for sharing. These are on my ‘gotta make’ list now. They look delish. I love raspberries, I love shortbread, can’t wait to make these! 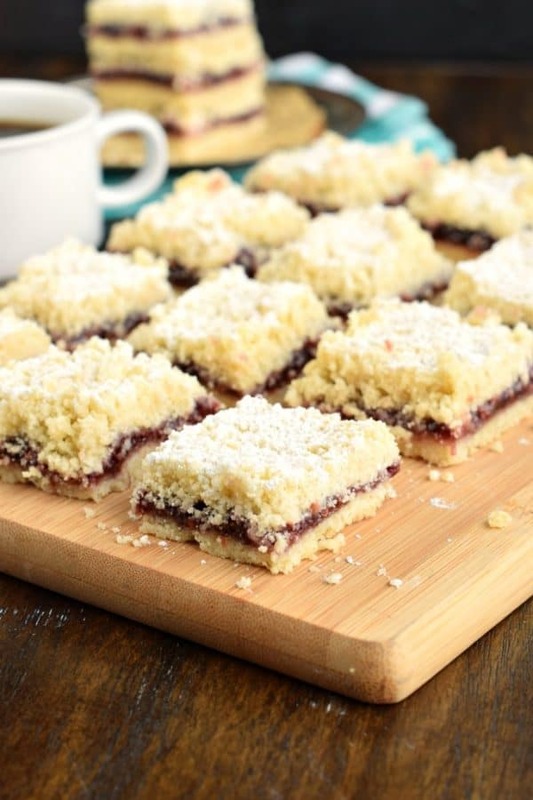 My family is going to love these raspberry shortbread bars. I can’t wait to bake these this weekend. These are great for my raspberry loving family! My favorite! These are the greatest! So good! Melt in your mouth shortbread cookie bars are the best! 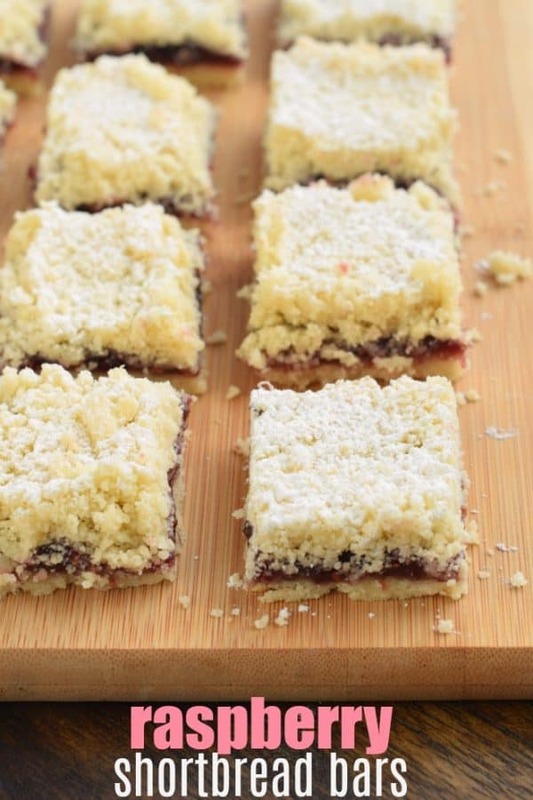 We loved these easy raspberry bars! Can you substitute raspberry jam?